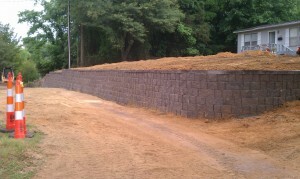 Retaining walls have two main purposes. First, they protect land that is near water from erosion. And second, retaining walls can direct water into a designated area or deter it from an area of land that you don’t want water to enter. If you live in the Lake Hickory area, some of your property may be sloped and difficult to make use of. Retaining walls can also eliminate this problem by creating an open and practical area of land that wouldn’t have been usable otherwise.